I love both etching and watercolor so lately, I have been combining them. This is a drawing that I did of a California red octopus on display at the Hatfield Marine Research Center, in Newport Oregon. The octopus was plastered to the side of the tank. 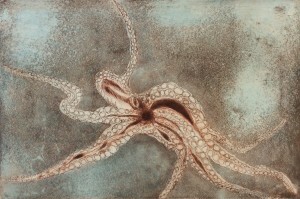 I transferred the drawing to a copper plate, etched it and applied a spray paint aquatint to give it the sandy background.